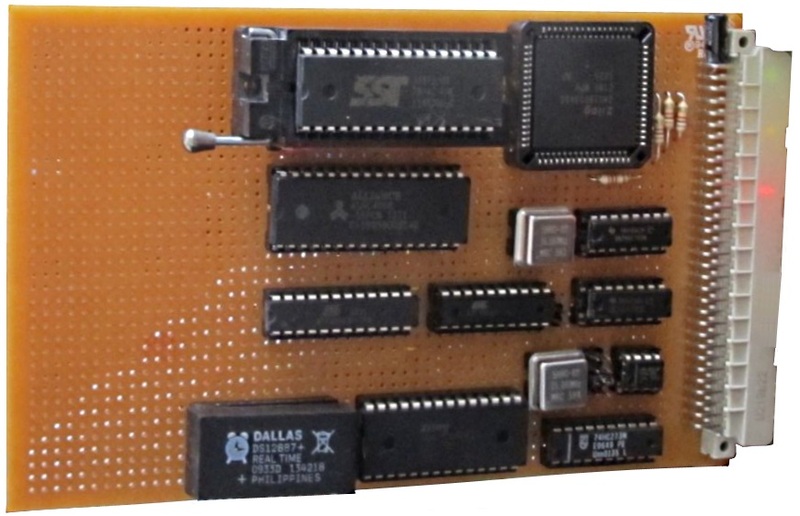 My original design for the CPU board was based on the use of discrete logic chips, like the original MTX. 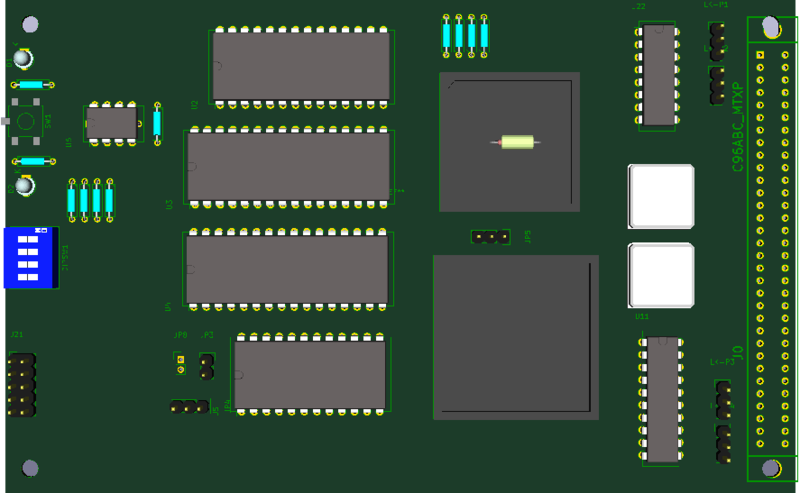 The design was more or less finalised when I decided to use a CPLD in the design to reduce the congestion on the somewhat cluttered circuit board and to make it easier to modify the glue logic should any changes be necessary. 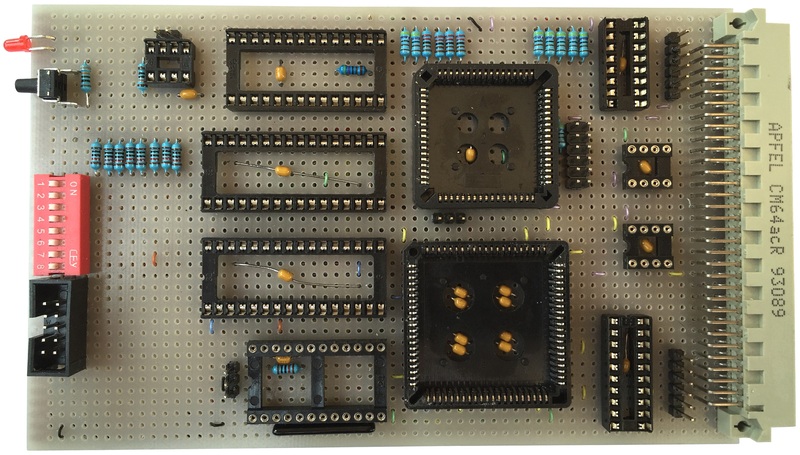 This led to the development of the Version 2 board, you can read about its design, construction and testing on the Version 2 CPU board page. Along with the Zilog Z80 CPUs that Lez had given Martin and I, he had also sent a number of enhanced Z80 CPUs, including the Zilog Z8S180. Martin used one of the Z8S180s to build another CPU board for MTXPlus+, so I thought that I had better do the same. As with the Version 2 board, I used an EPM7128SLC84 CPLD for the glue logic and Martin stuck with GALs. The buffers on the Address, Control and Data lines were deleted. As MTXPlus+ is mainly based on CMOS technology, the number of fan-outs was not an issue, so the buffers were an unnecessary complication that could have an adverse impact on the potential speed of the system. Since no peripheral devices needed it, the fixed 8MHz clock signal on the bus was removed, freeing up the backplane line and CPLD output for other purposes. 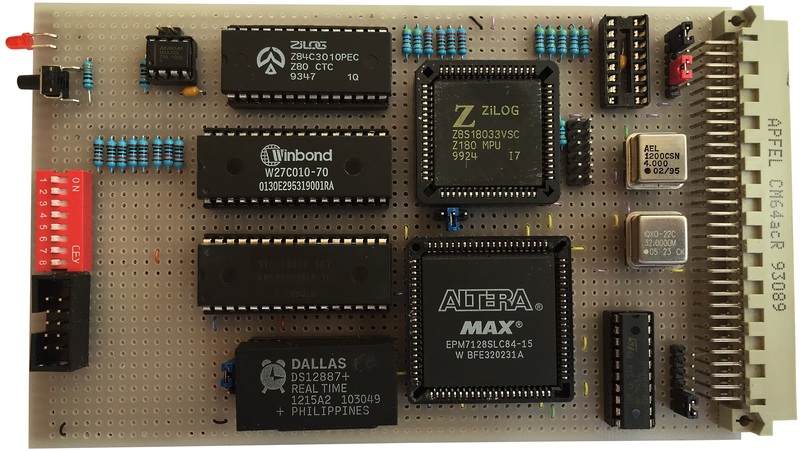 Development and testing of the Version 2 board had shown that my placement of the I/O in the CPLD was not ideal and required more LAB resources than was necessary. For example, I had assumed that assigning all 8 bits of the data bus to the same LAB would be an efficient use of CPLD resources, as it turned out, it was actually more efficient to distribute the data bits between the 8 LABs. 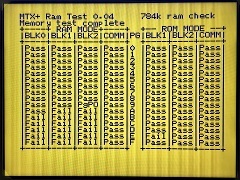 For the Version 3 board, as I had a working version of the basic CPLD code for the chip select and memory address logic, I was able to allow the Quartus fitter more freedom to place the I/O in the most efficient manner, rather than constraining it by manually placing the I/O when I developed the Version 2 board. One of the enhancements in the Z8S180 CPU is its ability to clock its internals and external devices at frequencies of half, equal to, or double the input clock frequency. The clock doubling feature only operates effectively with source clock frequencies of 10-16MHz, meaning that if it is used with MTXPlus+, the CPLD source oscillator should be no greater than 32MHz, resulting in an input frequency to the CPU of 16MHz at the fastest CPU board DIP switch setting. 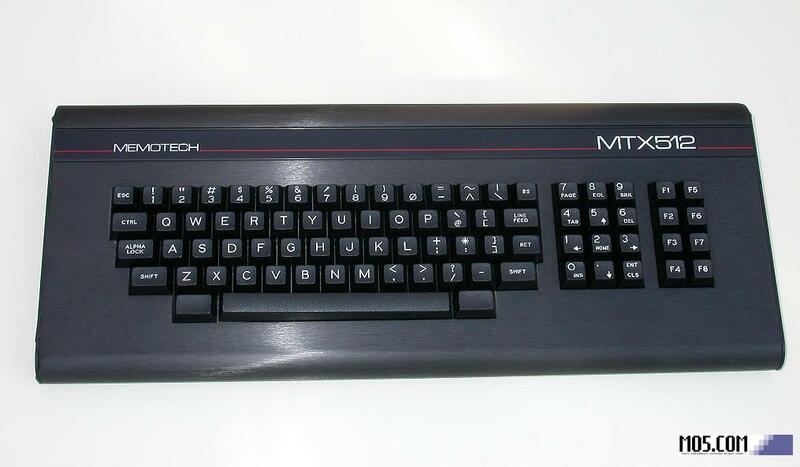 Whilst this would allow a theoretical clock speed of 32MHz, this is unlikely to be a realistic target for MTXPlus+, therefore, the Version 3 CPU board will initially use a 24MHz oscillator, giving a "stretch" target system clock speed of 24MHz with clock doubling enabled, although 20Mhz is likely to be the best achievable with my prototype board. 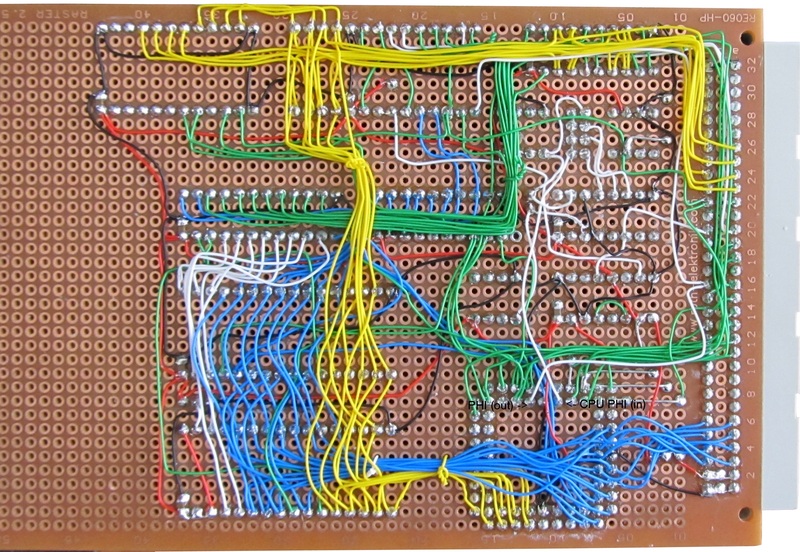 The backplane distributes a number of control signals to the rest of the boards in the system, the majority of these are standard Z80 control bus signals, generated by the CPU, but there are also a number of other signals generated or used on the CPU board that are distributed over the backplane. CPU clock source signal, assuming 24MHz CPLD source oscillator with the selected frequency set by bit switches 0 to 1. 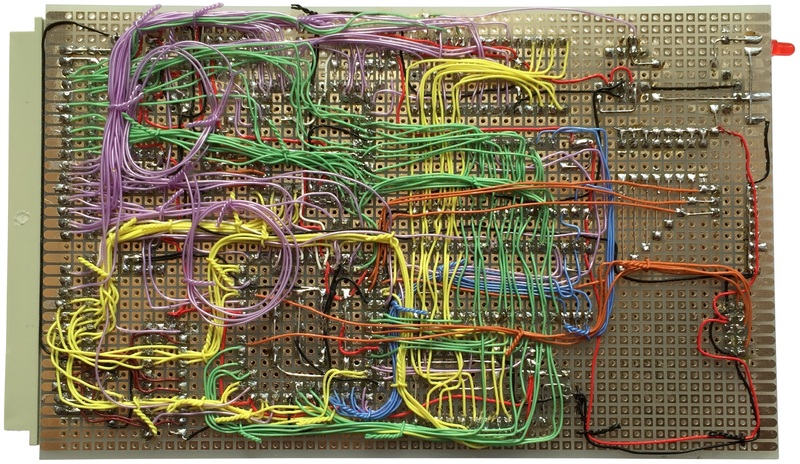 DIAG Signal to the Diagnostic board to latch 7-segment displays based on logic in the CPLD. Sockets for the main components positioned, the smaller PLCC (68 way) socket is for the Z8S180 and the larger (84 way) one is for the CPLD. 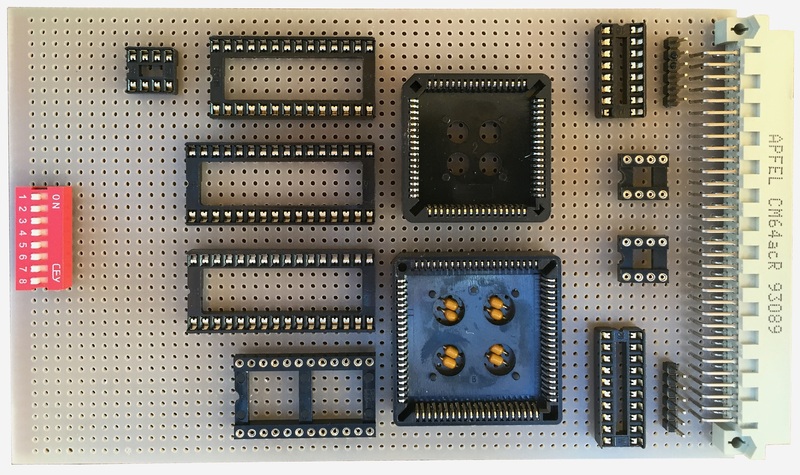 I wasn't able to source more of the good quality, double sided, prototyping boards that I had been using, this single sided board is one of Maplin's and is of much lower quality than my previous supply. 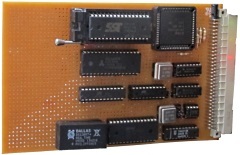 The completed board prior to testing. The shrouded 10-way header socket next to the DIP switches is the JTAG connector. The 12-way header next to the 68-way PLCC socket is connected to the Z8S180 serial lines. These will not be used initially, but were wired to the header now, rather than trying to add additional connections to the PLCC socket later should they ever be used. 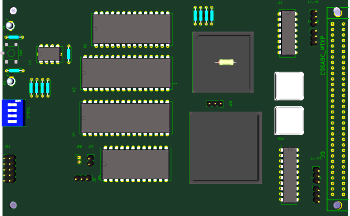 Initial testing of the board was done with a DVM to verify the connections were as per the schematic, then the CPLD was installed and the ISP JTAG connector used to load the modified program to the CPLD. For comparison, the wire side of Martin's Z180 board. 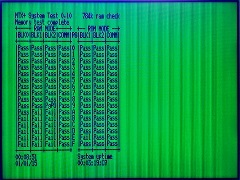 Rather than going straight to Martin's latest Z180 version of the MTXPlus+ ROM, I wanted to test the functionality of the board in discrete steps. 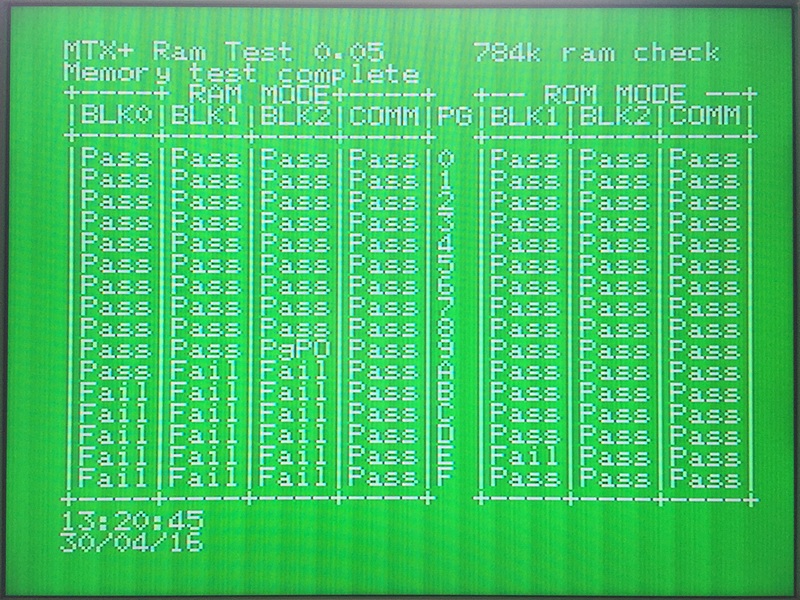 Here you can see the output from a very early MTXPlus+ test ROM, it does not access RAM and only needs the CPU, CPLD and ROM installed. 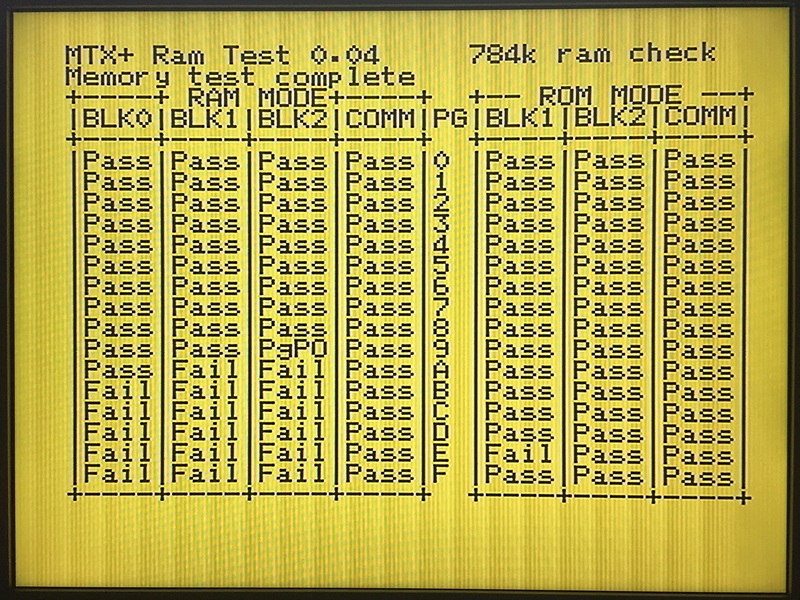 As the Z180 uses RAM for its stack, the read-back fails, but the test does prove that the CPU is working, it can access the ROM and can drive the video board (in MTX mode using I/O ports 01 & 02) - a great start! 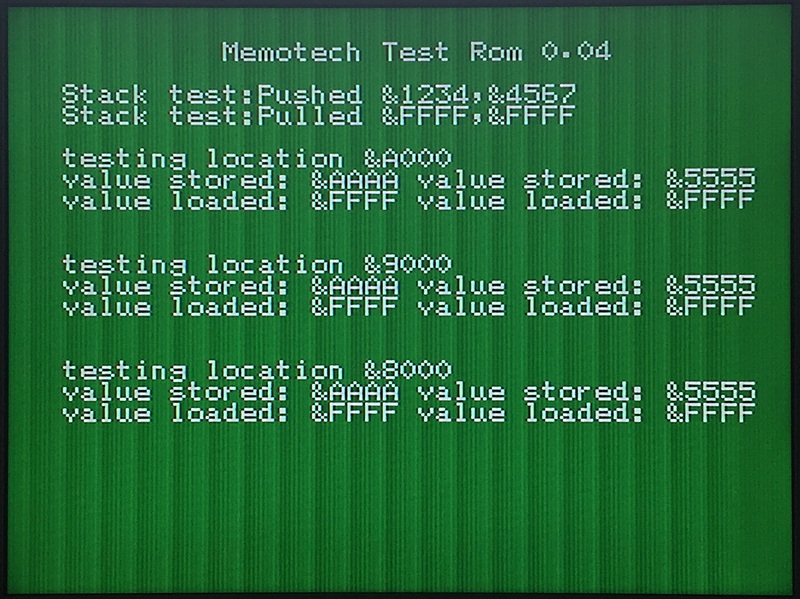 This test ROM verified that the MTXPlus+ component ROMs could be read and were available to be paged in by the MTXPlus+ system. 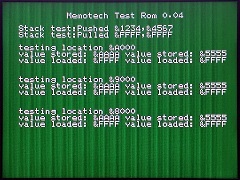 This test ROM checks the installed RAM and verifies that the extended memory can be paged into the address range between 4000h and BFFFh. 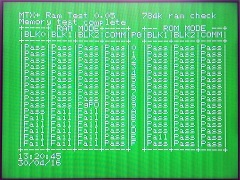 The ROM was written to test up to 784kB of RAM - the maximum available on Martin's Z80 CPU board with 2 x 512kB of RAM installed. 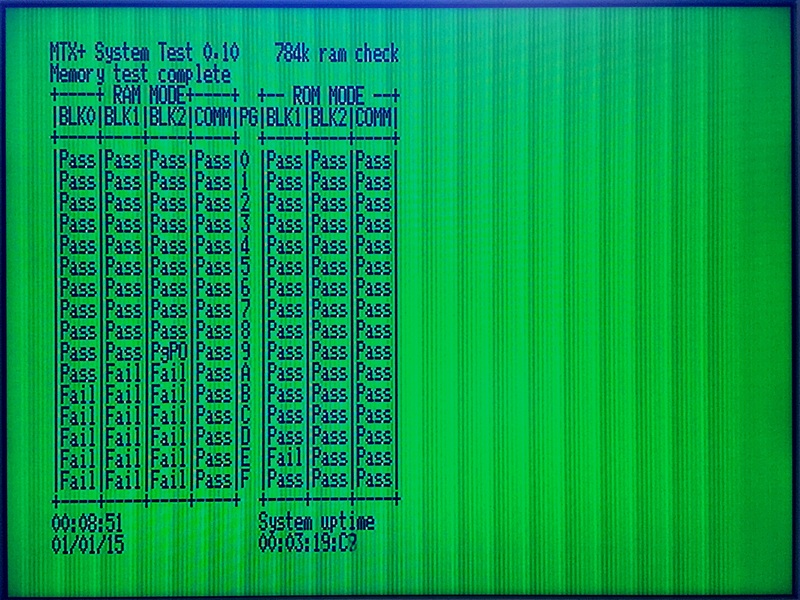 With "only" 512k on my Z8S180 board, the failures in the highest slots are to be expected but the test proves that the rest of RAM is available and working. This test reads and displays the Date & Time from the RTC. 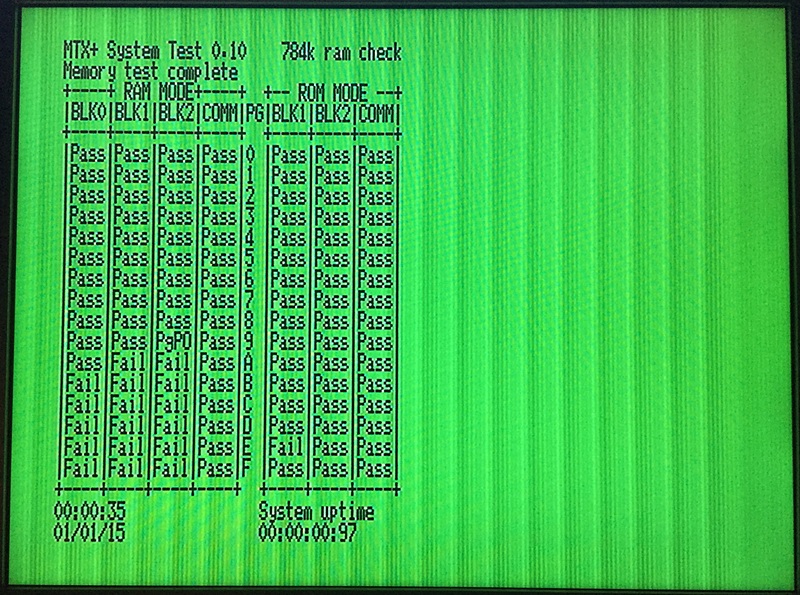 The RTC being used here had already been set up in the Z80 CPU board and had the Date & Time programmed, the values displayed are correct and current - another good result! This version of the ROM should exercise the CTC. 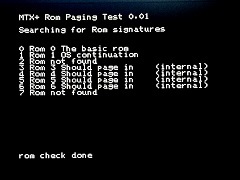 As the image shows, the system appears to "see" the CTC but the "System uptime" freezes after 0.97 seconds. 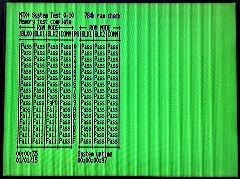 The first issue was there appears to be some conflict with the CTC when the Diagnostic board is installed, the CTC counts briefly, then stops. The second issue was related to how I had wired up the clock on the board. The Z180 features an internal clock multiplier, which is capable of running the CPU at twice the input clock speed. My original V3 design used the clock signal generated by the CPLD to feed the CPU clock input (EXTAL), the CTC clock input (PHI) and the backplane PHI signal. To keep peripherals synchronised with the CPU clock, the system PHI signal should be driven by the CPU's PHI output. With the Diag board removed and the clock signal rewired, the CTC now also runs. 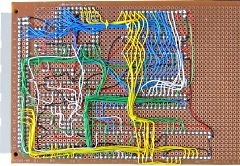 With (almost) all of the components and sub-systems tested, this is how the "finished" board looked. The one missing component is a 74HC193, used to divide the 4Mhz clock by 13 to provide the base clocks for the serial ports. I don't currently have one of those, but as the serial ports are not currently used, that isn't really a problem. The CPU board "design developments" were originally documented on this page, but the number and magnitude of the changes probably justifies their description on a separate page that I've called, oddly enough, Design Development. The main items are now just bulleted below, for details of the changes, click on the links to open the new page.